What we know about our commander in chief is that he is a lefty and loves to play golf and does so as often as possible especially when he vacations. In terms of his golf swing, we know he is a duffer with a big out to in looping swing, a nasty chicken wing and a high left to right ball flight with his driver. Although I cannot speak for his putting, I am going to assume by the two putters he carries that it is not his strong suit. What we know for sure is that he carries 17 golf clubs. 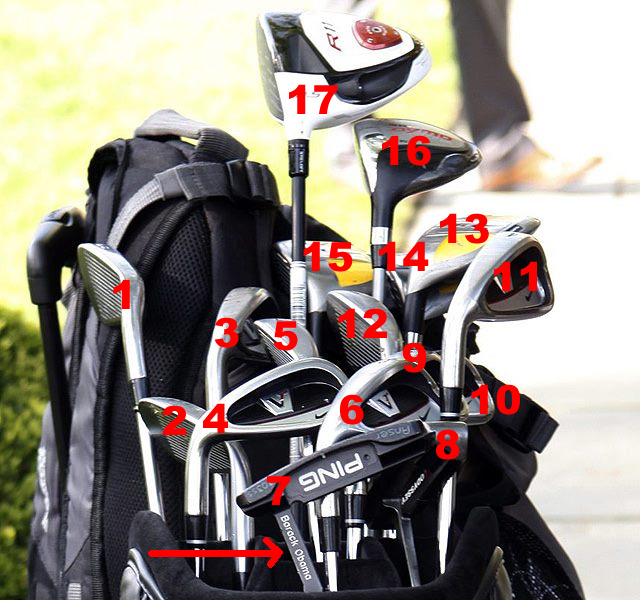 Although I cannot confirm the complete set makeup, I can confirm there is 17 golf clubs in the Presidents golf bag. From the picture here is what we project his current set makeup to be. What might surprise you is that he carries a 3, 4 and 5 irons in addition to the 3, 4 and 5 hybrids. It would seem logical that he would at least opt for a 2, 3 and 4 hybrid, ditch the long irons and start the iron set at the 5-iron through the PW, GW and SW. These are merely suggestions, suggestions just as the GOP might have for Mr. Obama about some of his policies. Jokes and politics aside, when you are the commander in chief, who is going to cry foul on you………maybe Joe Biden. What we don’t know is what flex Mr. Obama is using. It is my guess that with his age and his skill set that he is using regular flex. Recommendations for Mr. Obama – First, I would fit him for a super offset, No Bananas anti-slice driver with a mid to high kick point shaft. 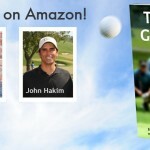 For a high handicap golfer, fairway woods are not necessary especially with the emergence of long hybrids. As for irons, some super game improvement Adams Idea hybrids and irons (2, 3, 4, 5 hybrids) (6-PW+GW+SW irons) with regular flex graphite shafts and some type of a anchor type mallet putter. Judging by the two putters he carries, any long shafted, oversize mallet putter is going to be more forgiving especially with good sight line. 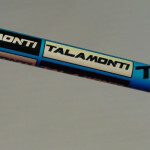 In terms of specs, he would likely be best suit with a longer shaft. Seeing how he is about approx 6’2″ an inch over standard would put him in a taller posture, suggesting a shallower plane and help him make a better turn and overall swing. Being the President of the United States inst what you call a stress free job. Knowing that, I would recommend at the very minimum a midsize grip. A larger grip would allow Mr. Obama to grip the club with lighter pressure (one less swing thought) freeing up the small muscles and allowing him to release the club head better at impact. Mr. President, if you ever want to setup a club fitting I am happy to provide my services free of charge. You know where to reach me.